The video version of Craigslist allows users to either upload, or view, videos when trying to sell or buy online. What if you could make your own commercial for the stuff you wanted to sell online? 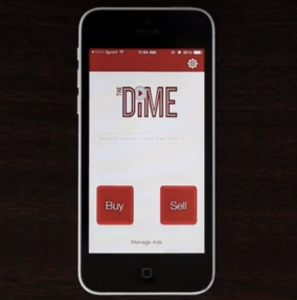 The DIME is an app created by Latinos that does exactly that. The app allows smartphone users to create their own commercials for cars, apartments, jobs, roommates, puppies, tickets or anything else you want to sell or buy online. We were lucky enough to nab an interview with Isaac Cuchilla, CEO of The DIME. The 26 year-old LA native is Nicaraguan and Salvadoran and found himself working with technology early in in elementary school; later when he became interested in journalism and worked at La Opinión, he found a way to fuse these two interests. MW: Tell me about The DIME and how you all came up with the idea. IC: During a brainstorming session with Erik Caballero, we were thinking about ways to bolster the newspaper industry’s revenue, and we started talking about its advertising revenue, in particular the classifieds section. We got to evaluating how Craigslist came in to poach the newspapers classifieds revenue and did it to the extent that newspapers were left scrambling. We wanted to create a product that made the overall local buying/selling experience safer and more interactive. MW: What are 3 lessons you have learned and would like to share with other entrepreneurs? IC: It takes a lot of work to get it from idea to execution. Then it takes an inhumane amount of work to make a company out of it. Be ready. There will be plenty of “no” before you get a “yes” when it comes to people believing in the product and raising capital for it. So just keep at it and don’t stop. Persevere. You can’t score if you don’t shoot. MW: Where are you with DIME right now? IC: We’re in the Apple App Store with our first version. Pretty much a Beta that has taught us a lot about where to improve and focus our future versioning goals. It’s a listening period where we improve upon the user experience. We’re working on our next versions and look forward to doing a full public launch. MW: Where do you see the company going in the next 2-5 years? IC: Providing our users the safest and most interactive experience in local buying, selling and promotion. Basically, the go-to platform for local content and goods— all in real-time video and everywhere you like to consume it. You can download The DIME here.